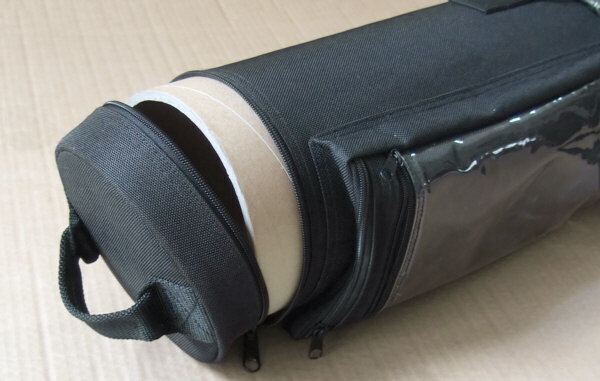 At last, a convenient way to carry rolled artwork, posters, blueprints and graphics! This large-diameter tube with rigid paperboard interior is fully covered in water repellant 600-denier polyester canvas. Opens at one end with a zipper for easy access. Detachable shoulder strap and leatherette grip make it easy to carry. Includes a window compartment for insertion of a shipping label. Great for shipping artwork or checking through as luggage. Large 6" diameter lets you roll graphics on heavy stock without excessive curling. At last, a convenient way to carry rolled artwork, posters, blueprints and graphics! This large-diameter tube with rigid paperboard interior is fully covered in water repellant 600-denier polyester canvas. Opens at one end with a zipper for easy access. Detachable shoulder strap and leatherette grip make it easy to carry. Includes a window compartment for insertion of a shipping label. Great for shipping artwork or checking through as luggage. Extra large 8" diameter lets you roll graphics on heavy stock without excessive curling. Oversized Item -- Add to Cart to use shipping charge calculator.